Carrie Cakeaway: Do you see what I see? My assistant was grocery shopping at a small neighborhood market when something caught her eye and made her jaw drop before putting a big smile on her face. The first strawberries of the season, and these were huge. We're talking gargantuan! 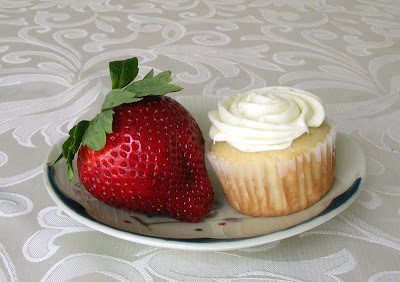 (The above photo features either a mini cupcake or a giant strawberry, and let me tell you -- that is not a mini cupcake). Better yet, they were sweet, juicy, and everything a berry should be. Three cheers for the return of the strawberry! We've missed you. Sweet zombie jesus! That thing is monstrous! Monstrously delicious looking, that is.